Today, Intel reports on its ongoing work worldwide to reduce its climate and environmental footprint in its annual Corporate Responsibility Report. Imagine enough solar panels to cover 52 regulation U.S football fields or 47 full-size soccer fields. 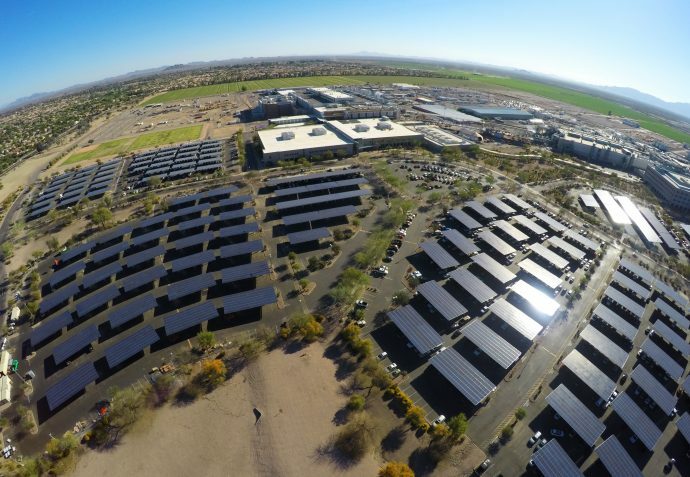 The company now estimates it has installed 3 million square feet of solar arrays at Intel sites in nine nations. They harvest 33 million kilowatt hours of green power, equivalent to the annual energy use of 3,700 U.S. homes. At its campuses across the U.S., Europe and Asia, Intel uses energy from the sun to heat and cool its buildings, provide lighting and produce electricity for on-campus use. Today, 100 percent of the energy Intel uses in its chip manufacturing business in the U.S. and Europe comes from renewable sources: solar, hydro, wind. Intel has for the past decade, according to the U.S. Environmental Protection Agency, been the United States’ No. 1 or No. 2 corporate buyer of green power.